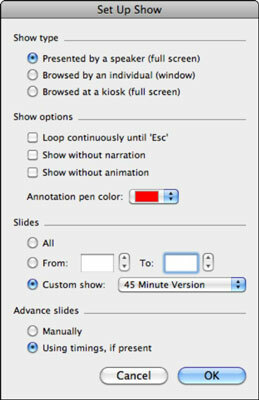 To display the Set Up Show dialog in PowerPoint, click the Set Up Show button in the Slide Show tab of the Office 2011 for Mac Ribbon, or choose Slide Show→Set Up Show from the menu bar. Either way, the versatile Set Up Show dialog appears. Presented by a Speaker (Full Screen): This is the type audiences are most familiar with. The presentation plays full screen, usually on a projector. This is the default type of presentation. Browsed by an Individual (Window): Choose this option to play your presentation on your computer in a window. This is the option to choose if you want to use screen-recording software to record your presentation. Browsed at a Kiosk (Full Screen): Choose this option and your presentation will play full screen on your computer. If you also choose the Loop Continuously option, PowerPoint can play your presentation endlessly. Also your keyboard and mouse clicks are disabled in this mode, so you will have to create navigational controls to move to the next slide or use automatic slide timings. To make a kiosk presentation that doesn’t stall as it waits for a click, make sure all your animations are set to With Previous or After Previous. Loop Continuously until Esc: When selected, your presentation will play over and over again until the Escape key is pressed. Show without Narration: When selected, narrations won’t play. Show without Animation: When selected, animations won’t play. Annotation Pen Color: Click the pop-up menu to choose a default pen color. Choose More Colors in the pop-up menu to display the Mac OS X color picker. Choose a color that contrasts with your show’s contents. All: When you play the show or use Presenter view, all slides will play. From – To: Use spinner controls to set a range of slides to play. Custom Show: If your presentation has one or more custom shows, you can choose which custom show will be presented when you play the presentation. In the Set Up Show dialog, you can choose either to require slides to play manually by selecting the Manually radio button or to use timings by selecting the Use Timings, If Present radio button. The latter option will advance slides automatically if they have transition timings applied. PowerPoint’s default is to use timings.